On October 4th 2009 a large number of people come out into the world full of the greatest joy and bearing one of the best gifts we can share with others: Gratitude. How does this state of Grace manifest and come to be? and it is unfair indeed if you do not appreciate it in thanksgiving. It begins in the heart of DiAnahita Kanoy, who with grace and tireless effort brings together so many elements. Most importantly, bringing us the Dance leaders who inspire us and work with her to create a fully rewarding experience for all who come. Finding a setting and coordinating all the people who help to provide the beauty which surrounds everyone, and ensuring the wide variety of experience through which we all learn as we light heartedly flow through each and every one. person has done for us. Those who come over and over to these events have the joy of finding new friends and keeping connected to longtime friends. Those who are new find they come into one of the most fully rewarding experiences they could expect. 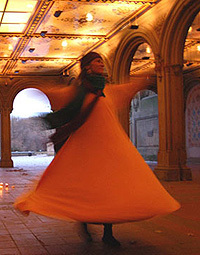 Dervish Dancing, Qui Gong, Drumming, Poetry, Readings, Meditation, Dances new and old, all flow along in a synchronicity seldom found in our everyday lives. 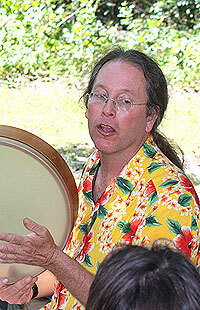 Allaudin brings his own well perfected "Teaching by Doing" both for the Dances and for the Drums. Laughter and his strong lead bring forth the unity we all come to be in. 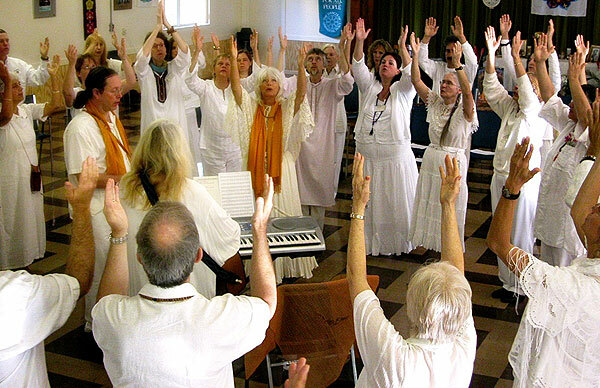 Lila's voice embodies her inner spirit as it pours forth and she inspires both the Sacred Harp of our voices and the Sacred Hands playing the guitars to be as spirit led as her own. Habiba's teachings in Dervish Dancing as a concentration was a wonderful addition as was her leading of Qui Gong early in the day. Tucking in times for rest, meditating, eating in community with so many well-loved friends new and old, made all of the rest so much more meaningful. Even nature mirrored the events below on Saturday night as the water and moon created crystalline halos whirling around the moon as the dancers whirled below. And even as we go about our lives now, a piece of each of us will always be turning in our hearts with the memories as we go forward. is like fragrance in the flower. Note: the descriptors are all from the reviews. See if you can find yours. The italic passages are from Lila's talk on Gratitude.